Ceviche is one of those dishes you’ve probably eaten at a restaurant, but more than likely haven’t tried to make at home. But why not? It’s surprisingly easy to prepare. Really, there are only two things you need to keep in mind. First, be sure your fish is fresh (never an issue when you shop at Granville Island), and second, that your citrus-to-fish ratio is right (easy-peasy with this recipe). Traditionally, ceviche is a mixture of raw white fish, shrimp and/or octopus, cured in lime juice, with peppers, onions, cilantro, and avocado, but Brian’s version offers a chance to try something different. Using halibut cheeks, known for being rich and tender, gives the dish an added depth of flavour and a touch of sweetness. In a glass or stainless steel bowl, stir together halibut, lemon juice, 1/2 cup (125 ml) lime juice and salt and pepper. Cover and refrigerate until a cube of fish no longer looks raw when broken open, about 4 hours. Drain and discard liquid. In a large bowl, stir together tomatoes, peas, radishes, green onion, and chilies. Drizzle with olive oil, honey and remaining 1 tsp (5 ml) lime juice. Toss before adding drained fish and cilantro gently folding everything together. Season to taste with additional salt. 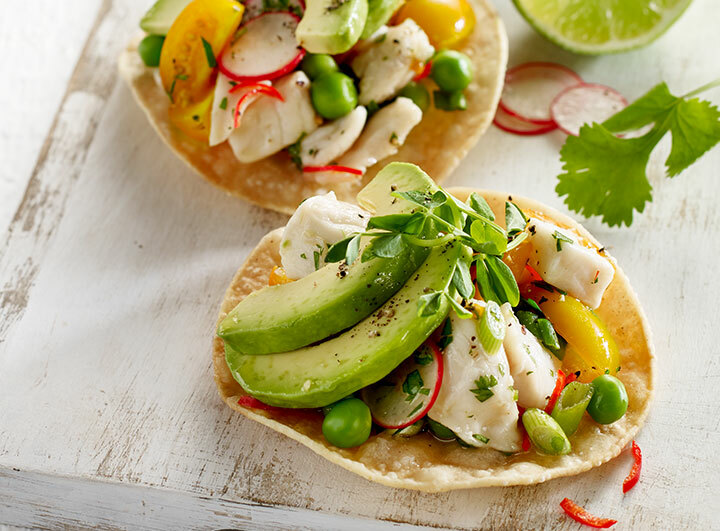 Spoon ceviche overtop tostadas, garnish with avocado slices and pea shoots and enjoy right away. Alternatively, dice avocado, fold into ceviche and divide among serving bowls. Garnish with pea shoots and serve with tortilla chips or plantain chips.